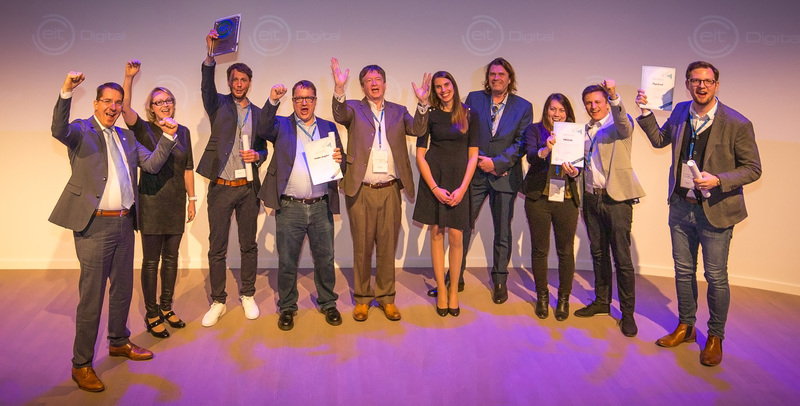 The Berlin-based scaleup trinckle 3D has won the first prize in the Digital Industry category of the pan-European EIT Digital Challenge. The competition was held during the EIT Digital Innovation Day at the High Tech Campus in Eindhoven, the Netherlands. trinckle 3D competed against ContactEngine (UK), Houston Analytics (Finland), Shipcloud (Germany) and Uwinloc (France), and receives a €50,000 cash prize plus a full year growth support by the EIT Digital Accelerator worth €50,000. trinckle 3D is a Spin-Off from the Free University of Berlin. The mission of Co-founder Florian Reichle and his 11 staff members is to ease the design process of 3D printed products. Their cloud based platform ‘paramate' enables businesses to leverage the full potential of additive manufacturing, even without 3D expertise. It is dedicated to automated product configuration that increases efficiencies and reduces expenses dramatically during the entire process. "Many companies underestimate the design costs when they enter the 3D printing industry . The trinckle 3D software helps businesses to save both costs and time in their 3D printing processes," co-founder Florian Reichle explains. "I am overwhelmed that we became first place. We took part primarily to access EIT Digital's global business network. We are working on our international expansion and looking forward to boost our business with the EIT Digital Accelerator team." The EIT Digital Accelerator comprises a team of experienced business developers and fundraising experts. They operate from 13 cities across Europe as well as a hub in San Francisco. Since 2012, they have supported more than 260 startups in accessing new markets and helped them raise more than €90 million in investment to date.